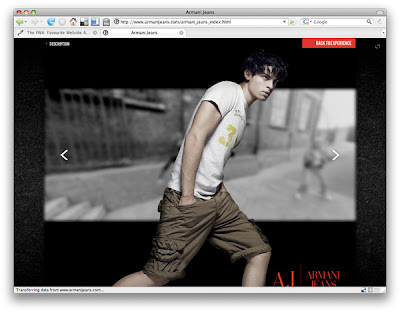 The Giorgio Armani site is a great example of connecting the brand to the visitor. 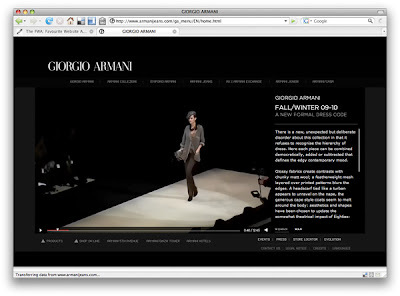 The site opens with a video of a catwalk show of their current season of clothes. Right here they set the tone of why you're here. Armani makes no apologies, they are a fashion company, that's why you are here. They don't try to pawn themselves off abstractly (like Reserved) or as the Tudors (like the homepage of Dolce&Gabbana). Nothing interactive here, just the introduction to the site. However, if you click on Jeans you're taken to a fully interactive experience. This section is basically a way to look through the jeans catalogs for men and women, and accessories. Here, the site connects to you personally. The setting isn't fabulous, it's just a series of alleys in "any-town" europe. 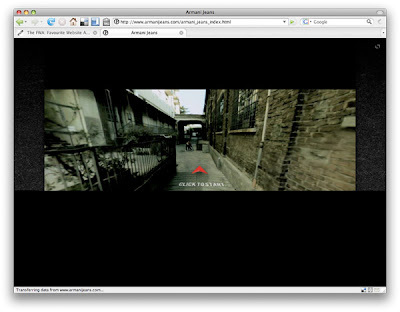 You basically explore a video of friends moving through these alleys. From an executional standpoint it's impressive. You can zoom-in to the majority of the video, and look 90 degrees right or left as the video is running. The video stops at certain points where you can click on certain people to see the catalogs. While obviously you're not a clothing model, this portion of the site takes you away from the over-emphasis on the fabulous fashion world, and instead, focuses on a fabulous execution.